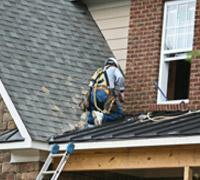 It makes good sense to have a roof inspection performed regularly to prevent leaks in your home or place of business. Leave it for too long, and weather, age and corrosion can do a number on your roof - and now you've got a leak on your hands. Don't let that leak become the need for a new roof - call us today for your emergency roof repair needs. We'll come right out and evaluate the damage, and let you know what you can expect in terms of time and cost. We're quick, efficient and we get the job done right the first time.